A mom wrote to me as she begins working on her young dancing daughter’s first solo dress. The little one is thicker around the middle. Since I have some experience with that because of my oldest diva, I told her I would write about how I dealt with it…and since I have been digitizing ’til I am dreaming about creating food out of embroidery stitches in my sleep, I figured a little writing break was in order. I am by no means an expert in dealing with this figure (I just slap a shapeless shirt on my own [say that 10 times fast: slap a shapeless shirt, shlap a slapesesh shirt, shap a shapish sh…]), but I have a couple of dresses under my belt and perhaps some readers will offer their own experiences and suggestions as well. That overwhelmingly wide, stiff triangle look was particularly unforgiving when it was under a thicker torso. It was a good thing when the waists started to drop, and even better when the skirts began to narrow. Now we are seeing some extreme dropped waistlines…nothing better for making all but the skinniest minnies look like sausage tubes (brings back horrid anorexia-inducing memories of college and gray unitards and clanging gongs and a hippie choreographer who never came to rehearsal with her feet on the ground, if you get my drift…)……..deep sigh. 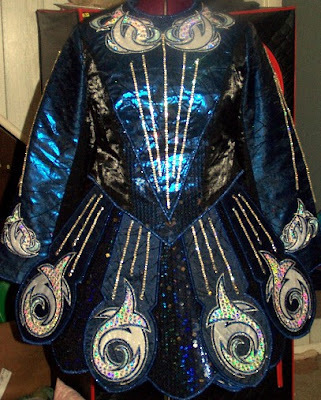 …yes, kamooflayging thicker torsos to create an attractive balanced look for the incredibly logical creation that is an Irish dance dress. There is always the usual use of dark colors over all, as well as using darker colors strategically so that brighter colors can pull focus. There was a time when it was de riguer for ID dresses to have a bright color down the center of the dress while the bodice and skirt sides were darker. Those were passing when I started with my girls in ID. You do see some of that still but it is not as stark a use of contrasting colors as it used to be. So, off to the fabric store you go. You want a color that complements your dancer’s coloring, obviously, but make life a bit simpler for yourself by letting the dancer loose to be drawn to the colors she likes. It is rare that a dancer (or anybody, for that matter) will claim as their favorite a color that looks bad on them. You may not like it, but hold it up under your dancer’s face to see what happens. It will probably work beautifully. I have since always trusted the dancer. Now, it is rather subtle, but you can see that the center of the bodice and the center front skirt are lighter than the sides and the sleeves. There is a black sparkly overlay over the darker parts. In the sunlight in that pic it is not as pronounced a difference as it really was. The design also worked to draw the eye in…you can’t see the top of the cfp but the design comes to a point like the bodice design. The diva’s next dress was a bit more dramatic. This time we made more of an effort to draw the eye in by using black on the bodice & skirt sides and by making the bodice point down the center along with the long tapering design. In fact the black was so successful that it looks as if the bodice is standing away from the offset skirt waist. 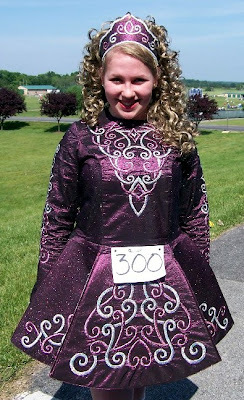 It is a 2 piece, but the bodice fit snugly so there was no space at the waist between the bodice hem and the skirt. The long straight lines of crystals also help draw the eye in. I did make this skirt very offset which means the “sides” of the dress were more than 2 inches forward of the diva’s actual side. This again tricks the eye into interpreting the front waist into a narrower width. Another trick is to direct the eye upward to the face by creating interest above the bust line. You can do this with a collar design and/or a corset bodice look. I wrote about my approach to the corset bodice here: corset-style bodice . And that brings me to the design itself. As I just wrote above, you can keep the eye away from the torso by keeping your embellishments above the bust line. 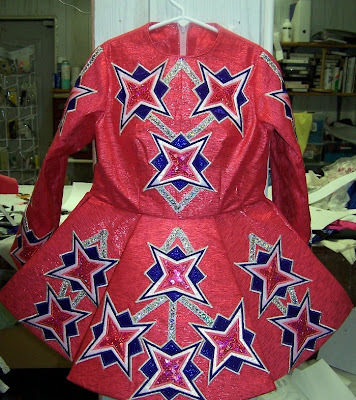 Another technique is to make sure that any design that comes down below the bust is thin or tapered…anything wide will just accent the dancer’s width. Ultimately, I am a big believer in making the dress that the dancer wants, making the dress that makes the dancer feel like a spectacular princess. When she feels beautiful, she dances beautifully. 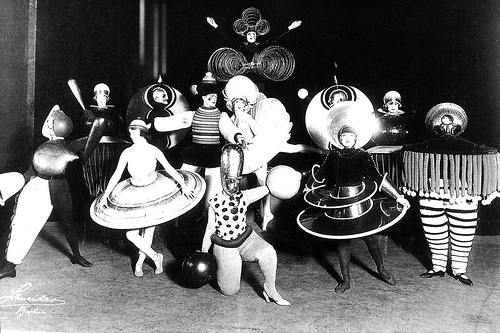 Over the course of my life as a performer, I had to wear some pretty awful & humiliating things because someone (choreographer, director, costume designer) forgot that embarrassing the dancers meant they would not dance their best…we tried, but when you feel like a stuffed gray sausage you tend to dance like one!